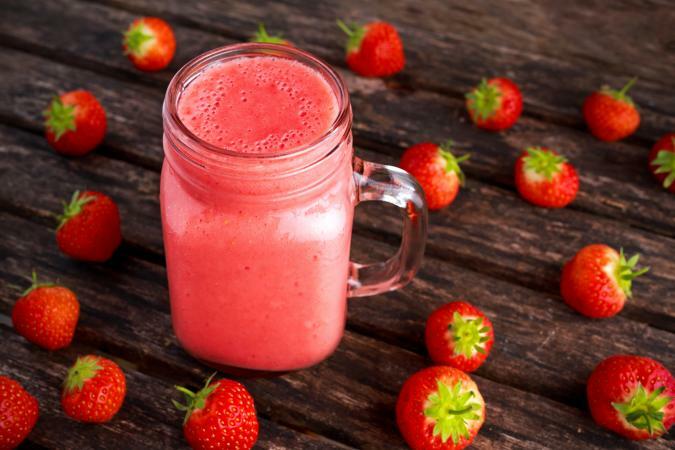 If you are following a vegan diet, don't like yogurt, or are lactose intollerant, it helps to follow a strawberry smoothie recipe that doesn't call for yogurt. The solution to creating a creamy, thick, dairy-free smoothie is to substitute silken tofu for yogurt and add a sweetener, like honey, agave nectar, or a flavored soy or nut milk. Here is a quick and easy strawberry smoothie recipe that you can easily customize to suit your tastes. This recipe makes about one or two servings. Blend well until the smoothie is the desired texture. Yogurt-free strawberry smoothies don't tend to keep well, even when refrigerated. Because of this, they should be consumed immediately after they are made. If you're planning on making a big batch of smoothies for several people, you can prepare all of the ingredients beforehand, but wait to blend everything together just before serving. Try freezing your fruit before blending the smoothie. Frozen fruit will make the smoothie ice cold, which is very refreshing. For a stronger strawberry flavor, use berries that are just starting to become overripe. They should be slightly soft and deep red in color. Add your favorite flavor(s) of fruit juice to the smoothie recipe, adjusting the amount of other liquid ingredients proportionately. Instead of tofu, add a frozen banana to your smoothie for a nice creamy texture. Skip the milk and tofu all together, and use a combination of strawberries, fruit juice, and ice. To thin out the texture of a smoothie, add more liquid. Water can be used in a pinch, or add more soy milk or fruit juice. To thicken a smoothie, add more tofu or fruit and reduce the amount of liquid. Add extra flavor with lemon or lime juice, or try a few drops of vanilla, a touch of cinnamon, or even some chocolate syrup or cocoa powder. All kinds of nutritional supplements can be added to smoothies, from protein or fiber supplements to wheat germ. Test these out using a small amount at first to see if they affect the taste of the finished smoothie. Smoothies are great for breakfast, or they can be a satisfying snack. Try using a portable, insulated cup for your smoothies and you can take them with you on the go.